Hyper-convergence is now widely accepted as the “way to go” in terms of cost-efficiency and simplicity, though the architecture itself is relatively new. It is already affordable even for SMB and ROBO, so the market grows at astonishing rates, offering companies of every scale a way to create their IT infrastructures from scratch. The main idea is to minimize the amount of hardware required for the same task by unifying compute and storage resources on the same platform. Such a setup is great in terms of money savings and performance, though not so convenient to scale, because one can’t leverage compute and storage resources independently from each other. The latter is considered the only serious drawback of hyper-convergence. While SSD-based hyper-converged platforms are typically too expensive, HDD are associated with similar and other drawbacks. Their mechanical parts are prone to malfunctioning, which may result in data loss. In time, hard disk technology changes its form, so what’s available now is no longer compatible with an old appliance. Thus, adding capacity will mean either a long hunt for obsolete products, or a complete overhaul of the whole storage part. Besides, when it comes to meeting capacity requirements, it is always a matter of overprovisioning “just in case” and spending more money on disks than it is really necessary. With the general money-saving aim of hyper-convergence, these issues become critical. StarWind HyperConverged Appliance with AlcoudA is the hyper-converged platform, which can scale storage precisely as required, without any overpaying. AcloudA is a simple device that attaches to any existing appliance into an SATA or SAS HDD slot. It serves as a cloud gateway, utilizing standard iSCSI and SMB3 protocols, so it works even if such functionality is restricted by vendor or initial specs. AcloudA overrides vendor lock-in and enhances the capabilities of storage and hyper-converged platforms. Replacing one HDD in the StarWind HCA with AcloudA enables a ready-to-work secure cloud gateway. The device mimics a hard disk, but functionally creates a link to cloud and stores all the incoming cold data there. Thus, scaling is done by purchasing the exact required capacity in cloud, which gets cheaper as more space is bought. AcloudA is completely impervious to hacker attacks, because it gives no physical capabilities to intrude into LAN. Even if the attacker manages to find an exploit and take control of the device’s proprietary OS, he will achieve nothing. As long as all the mission-critical data is encrypted and the keys are kept safely on the primary storage, the cloud uplink is completely secure. StarWind HyperConverged Appliance with AcloudA is the easily-scalable hyper-converged platform. 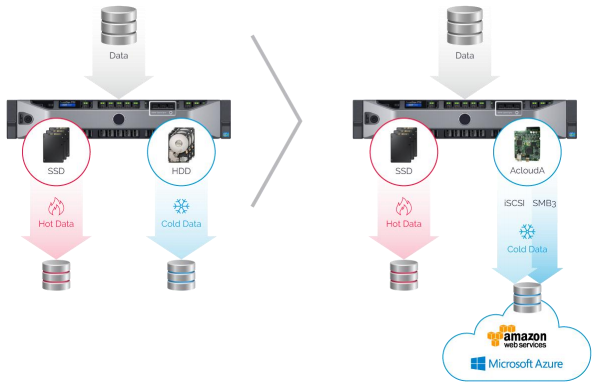 It utilizes a plug-and-play cloud gateway that fits into HDD slot and utilizes standard iSCSI and SMB3 protocols to establish connection. Thus, it can send all the incoming data to cloud, using it as a secure remote storage.